With limited budgets, increasing costs, and steady program growth, fundraising has become an important component of our program's success. Bowmen football relies on the income from the following fundraisers: Bowmen Card sales, the Player Sponsor program, Sherwood Youth Football Camps, and home game concessions. For just $20 each, the Bowmen Card will get you fantastic deals at 26 local businesses PLUS online savings with many popular merchants. Bowmen football players start selling cards in mid-August and continue until they are sold out. Get yours before they're all gone! Drills to develop and improve speed, agility and quickness. 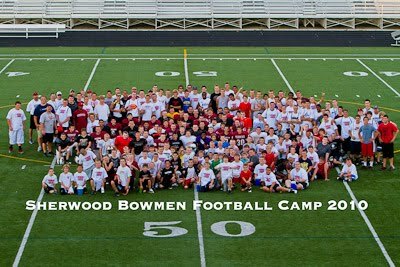 To add to the fun, Bowmen football players will assist with both camps. Once available, registration forms will be posted on the Sherwood Youth Football website. The Booster Club organizes and oversees concessions, but it gives a portion of the money raised to the organizations who work during games. These funds are significant, and are an important part of the football fundraising income. Families of freshman and sophomore football players staff concessions during home football games. A work schedule is posted in late August.